Having duly achieved parity in the last few weeks and tested 0.95 as a result, the dollar to cad pair appears to have reached the end of this particular cycle as it now attempts a longer term recovery and move higher. Technically the rounded bottom of April and May suggests a solid platform of support and in the last 2 days we have seen the dollar cad break through an initial level of resistance between 1.02 and 1.028 as it continues its path higher marginally touching 1.04 in early trading this morning. The short term moving averages are now beginning to turn and the 9 day in particular is providing strong support to the rally higher which is further emphasised by the crossing of the 14 day average above the 40 providing a bull cross signal. 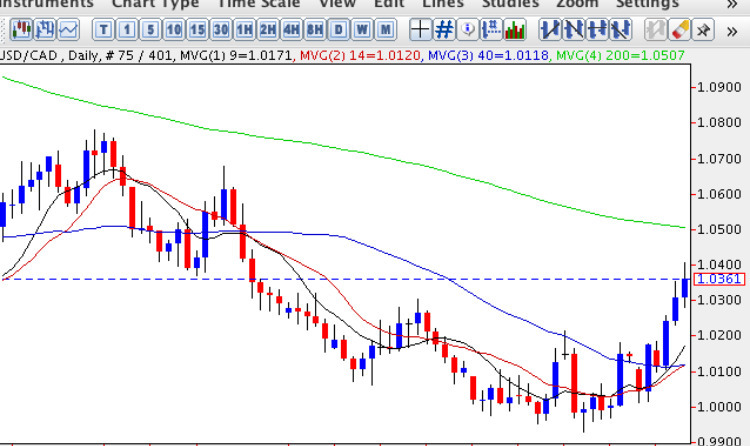 For this rally to be maintained we need to see an initial break and hold above the 200 day moving average which currently sits in the 1.05 price area and once this has been achieved then 1.068 becomes the next logical target where the upper level of recent resistance now resides. Should this level be achieved then we can expect to see a possible re-test of 1.1 in due course largely fuelled by a further surge in the US dollar which continues to reclaim lost ground on the dollar index. Important items of fundamental news for the US and Canadian dollar include yesterday’s ADP figures which came in better than expected at 32k against a forecast of 29k which tends to suggest that tomorrow’s non farm payroll figures for the US are likely to come in better than expected (the current forecast 197k). For Canada today we have Building Permits which are due to be positive at 0.6%, improving on last month’s figure of -0.5% whilst in the US we have the unemployment claims forecast at 441k, marginally lower than last week’s 448k. Later in the day we have the IVEY PMI data, a sentiment indicator, forecast to come in flat at 57.7 – virtually unchanged from last month. Finally on Friday we have the unemployment data for Canada which is expected to be positive at 20300 – adding a further 2400 jobs since last month, with the unemployment rate remaining flat at 8.2%.